1. What’s new and/or what are the research highlights? 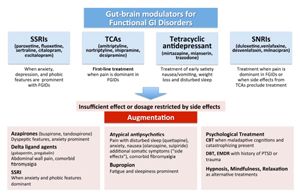 Drossman: This is the first and most comprehensive review of the use of central neuromodulators for painful functional gastrointestinal disorders (FGIDs) like irritable bowel syndrome (IBS), centrally mediated abdominal pain and other painful symptoms. It is the culmination of an 18-month project (a Rome Working Team) where we did an evidenced-based review of the literature and consensus of experts to come up with recommendations. One key point is that we are changing the use of antiquated terminology of “antidepressants” and “antipsychotics” which were developed originally to treat psychiatric disorders, and replacing with the term neuromodulators. The new term reflects better our understanding that these are disorders of gut-brain interaction (Rome IV). In that context, we are treating a dysfunctional brain-gut axis with these medications, often in doses lower than for treating major psychiatric disorders. Some of the major findings are that tricyclic antidepressants (TCAs) and SNRIs do work for pain. However, if a single medication does not work or has side effects, we employ the concept of augmentation (combining two or more treatments) to help those that don’t initially respond. Also, patients are kept on them for a year or more for relapse prevention. It is a way to provide ample time to reverse the dysfunctional circuitry causing the FGID problem in the first place, and it may reverse the neurodegeneration that occurs over time. Finally, if there are frequent side effects or a failure to respond we recommend doing pharmacogenomic testing, a new method to evaluate how patients genetically metabolize these medications. Also, it’s important to realize that the ways in which we employ these treatments for FGIDs is different from how psychiatrists treat psychiatric disorders. In fact, psychiatrists are not well versed in these methods. 2. What do physicians need to know? Drossman: This is a paradigm shift. We are looking to re-educate clinicians to understand the value of these medications for GI pain, nausea, and bowel dysfunction in cases, particularly where traditional GI drugs don’t work. Physicians are not aware of many of the newer methods for managing the FGIDs and feel poorly trained in the use of these medications. The Rome Foundation is looking to increase this understanding. This Rome Working Team report will be out in March in Gastroenterology currently online for access to those who have a journal subscription. In addition, we will be holding a major symposium at DDW on Saturday June 2nd at the Washington convention center from 2-3:30 “Central Neuromodulators for Chronic GI Pain and FGIDs (DGBI) – A Rome Foundation Working Team Report”. The speakers will be me, Alex Ford and Jan Tack. In addition, on Sunday at DDW (June 3) there will be a breakfast session “Using Neuromodulators for Disorders of Brain Gut Interactions: A Primer for Clinicians” with myself and Harley Sobin, MD. For this session, we will do some practical case based guidelines. Thus, we are beginning to see a major change in the acceptance and value of these treatments. 3. What’s important for patients to know? Drossman: They can be helped! 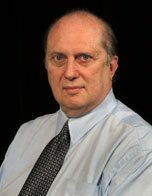 Additionally, patients should know that the Rome Foundation is reducing the sense of stigma by avoiding unnecessary attributions relating these treatments to psychiatric disorders. We believe there will be a big difference in acceptance and benefit to patients over the next few years as more and more physicians use them with a proper understanding of how they can benefit these chronic gastrointestinal symptoms. With regard to DrossmanCare – we have been taking care of hundreds of patients over the years in this manner and helping patients with the most refractory symptoms who have been to other medical centers without benefit. In our practice [see below citation], the combination of good communication skills to help patients understand the physiological value of these medications coupled with our knowledge of selecting the best medications or combinations of medications to treat these FGIDs make a difference to help those that have previously failed treatment. I left UNC in part out of a commitment to improve patients suffering from these disorders using these methods and now we see it happen.